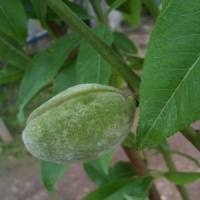 Almond Ingrid is is considered to be one of the most reliable croppers in the Almond family. The Almond is also known for it stunningly pink blossom in Spring as well as the delicious nuts that it produces. A beautiful sight when in full blossom plus good crops of excellent quality almonds.